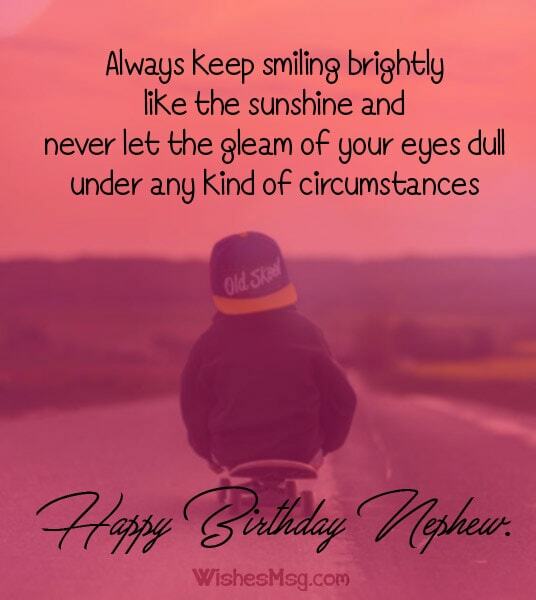 Birthday Wishes for Nephew : If you are looking for heartwarming birthday messages for nephew, you have arrived at the right place that will provide you happy birthday messages that your nephew will love. If you are an Aunt of your nephew, you will find motherly messages that will express your love for him who is like your sun. Furthermore, we have written messages that uncles can say to their nephews that are inspiring and will express fatherly love towards him. In addition, the happy birthday wishes that we have listed is not gendered specific and can be sent both by aunt and uncles. 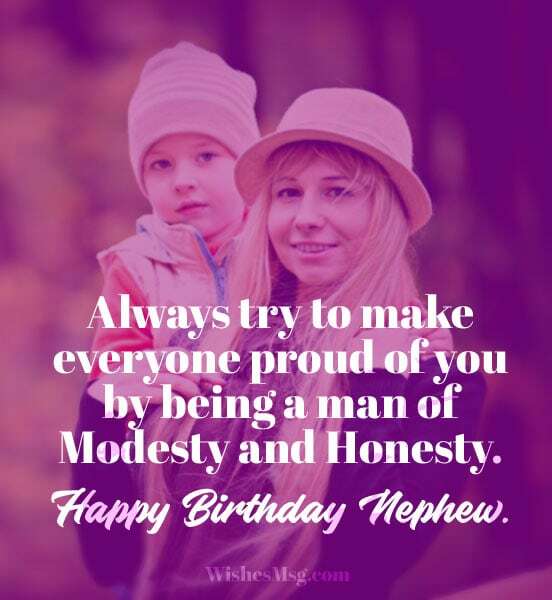 Receiving such loving and caring happy birthday messages will melt the heart of your nephew making the bond that you share with him, even more, stronger with love. Moreover, you may use these messages as a description of the pictures that you post on social media with your nephew on his birthday. The greatest gift that I can give you today is blessings from the core of my heart that will stay with you lifelong. Happy birthday Nephew. With the charm of yours keep the house lighted up with prosperity and by keeping everyone pleased with you. Happy birthday, nephew. Seeing you grow up really astonishes me, it seems like it has been just a few days when you used to sit on my lap. Happy birthday, my handsome nephew. Always keep smiling brightly like the sunshine and never let the gleam of your eyes dull under any kind of circumstances. 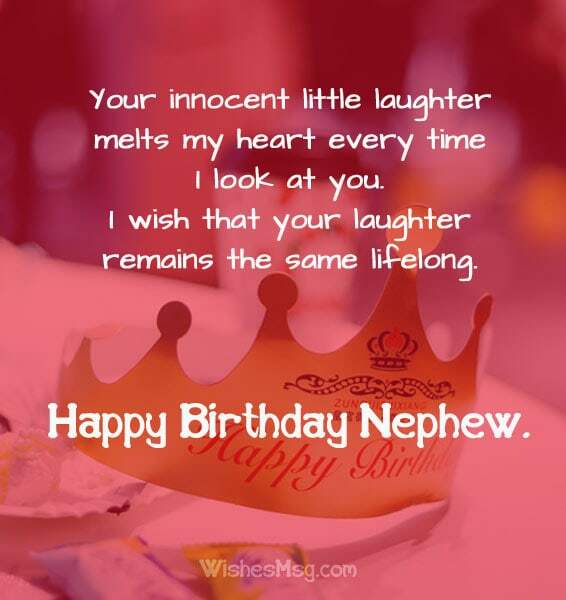 Happy birthday, Nephew. I wish that the Almighty bestows all his blessings upon you so that you can achieve prosperity and success in your life. Happy birthday, nephew. Your value in my life cannot be portrayed in words. You are like my first child. Happy birthday nephew. Keep the honor of our family your first priority like you always have. This is the greatest piece of advice that I would like to say to you on this special day of yours. Happy birthday nephew. Always value the bonds with your loved ones. Your loved ones are the greatest gift that you have. Happy birthday Nephew. You have always considered me equal to your mother. And like all mothers of the world, I wish all the happiness of the world for you. Happy birthday Nephew. I pray for you to reach the highest heights of success in life, and make me the proudest Aunt of the world. Happy Birthday, Nephew. Always try to make everyone proud of you by being a man of modesty and honesty. Happy birthday nephew God bless you abundantly! I pray that the Almighty keeps you away from facing hardships of life, and I hope He keeps you blessed like always. Happy birthday nephew. I feel blessed that you are the eldest son of our family. The way you take up responsibilities makes me feel proud as your Aunt. Happy birthday, nephew. I have seen you cry over pretty little things. But today seeing my crybaby grown up makes me emotional. Happy birthday, nephew. I feel like an oldie seeing you grow up; I miss the moments when I taught you how to ride your cycle. You are a champion now! Happy birthday nephew. 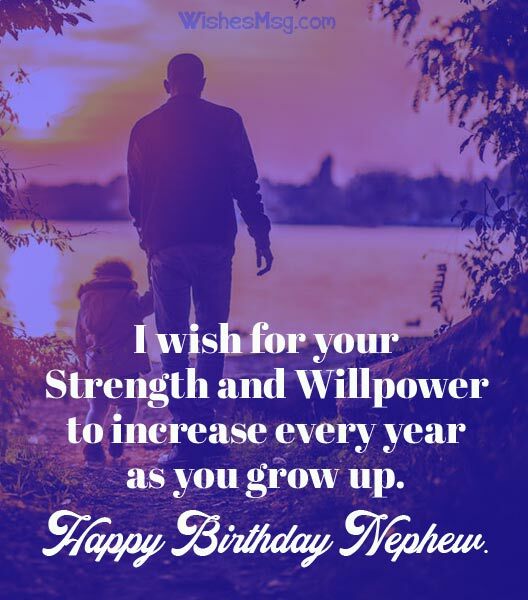 I wish for your strength and willpower to increase every year as you grow up. Happy birthday, nephew. No matter what difficulty you face in life, always remember that your Uncle will be supporting you with strength like your father. Happy birthday, nephew. Be a champion and strive hard to achieve all the goals of your life and accomplish your dreams. Also, remember you have my support like always. Happy birthday, nephew. Don’t forget to celebrate all the moments of your life along with working hard for success. Happy birthday, nephew. Apart from being the eldest son of the family, be a man of words and kindness, doing great good deeds. Happy birthday handsome nephew. As your first tooth arrives, I pray that angels bestow each time when you grow your rest of milk teeth. Happy birthday nephew I love you. Your innocent little laughter melts my heart every time I look at you. I wish that your laughter remains the same lifelong. Happy birthday nephew. You have passed a year of your life, I pray that the coming years bring happiness and prosperity in your life. Happy birthday nephew. The stage of a long journey of growing up with ages has begun from today. I hope your journey is filled with blessings. Happy birthday nephew. May your little efforts of crawling soon turn out a success and you run around the house with your little cute feet. Happy birthday to my awesome nephew. To conclude, we have written happy birthday messages that you can write on cards to wish your nephew when he is 1-year-old. When he grows up and reads these cards filled with loving messages and wishes, he will be overwhelmed seeing the love that he received from his aunt and uncle since he took birth. Preserving these cards to read when he grows up is a way of preserving the love and care that was taken of him during his childhood.